Is Dangeresque 3 another box office hit? The time has arrived - after 4 years, one of the most anticipated Strong Bad-related things is finally here! In Dangeresque 3, the sequel to Dangeresque 1: Dangeresque, Too? and Dangeresque 2: This Time, It's Not Dangeresque 1, you once again need to search for clues and talk to various characters to advance the plot. This time, though, you don’t really play as Strong Bad - you play as Dangeresque! (No, it’s not just Strong Bad wearing sunglasses, where did you get that silly idea?) The game opens up with Strong Bad answering yet another fan e-mail asking when the movie will finally be released. 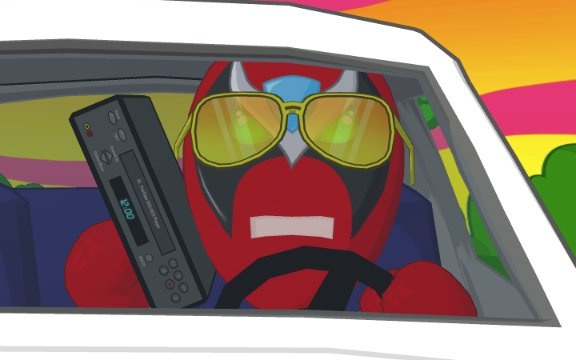 Coincidentally, it was just finished, so Strong Bad pops the movie into his VCR and the rest is up to you! Dangeresque 3 tries to be as much like a low budget action movie as possible: cardboard title cards, abrupt transitions and obviously fake stunt actors are all present and correct. It’s also packed with clichés: Dangeresque must team up with old adversaries to defeat a new foe, he gets to find his missing father, Dadgeresque, and he has to get information from shady informants -- stuff you'd find in pretty much any other action film. All old Dangeresque characters return and they’re just as cheesy as they used to be. Perducci, Killingyouguy, Cutesy Buttons, Renaldo and others all make an appearance. Every character is horrible at acting, which just adds to the humour. They mis-pronounce names, read the dialogue in very monotone voices, and even forget lines! Another thing worth noting is the ridiculously high number of different locations this time. There's so many that your map (which, this time, is a super high tech global positioning system) will only have a single empty space left at the end of the game! 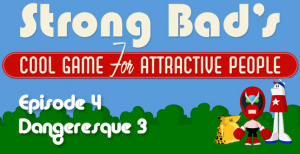 Like the other episodes of Strong Bad’s Cool Game for Attractive People, there’s a “retro” game to play as well. In 'Space Circus Catastrophe', you must rescue members of the space circus (performers, ringleaders and bears) while shooting down evil space clowns. You also have to dodge asteroids by quickly moving in the opposite direction of where they’re coming from. Like the previous games in the series, it’s fairly simple but for some reason it manages to entertain longer than the others. Unfortunately, just like the previous episode, there’s no do-it-yourself Teen Girl Squad comic this time – Sorry TGS fans! The Extended Play (unlocked after beating the main game) in this episode is also a bit more entertaining. This time you can see deleted scenes, bloopers, and other material cut from Dangeresque 3. As with the three episodes before it, you will most likely take around 2 hours to beat this instalment. 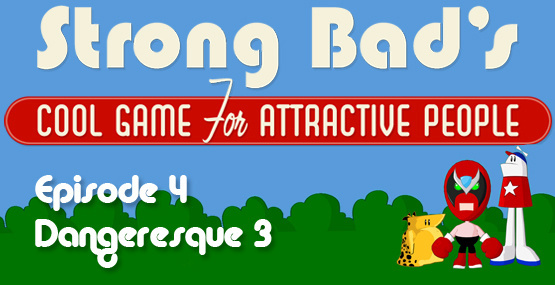 Dangeresque 3 is pretty much just like the previous episodes of SBCG4AP – not too long, but fun while it lasts. This episode is a bit different from the others in that it actually finally successfully delivers something the website has been promising for over 4 years. With lots of funny dialogue and memorable moments, such as thwarting the invincible Killingyouguy in a car chase and defeating an amazing CGI monster, this is easily the best episode yet in the series. Let's hope the series finale is even better! I think I should pick up the series sometime now. It's getting interesting! 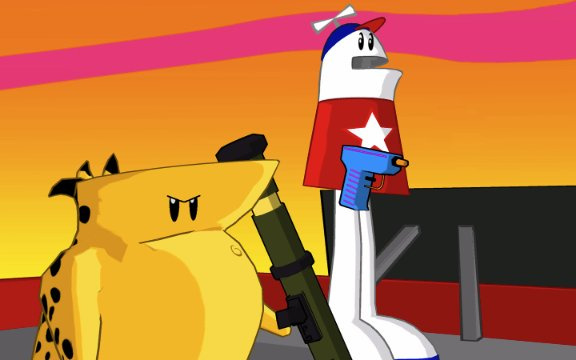 Mind you, as we know, Episode 3's Wiiware release out here is running late, and I already (impatiently) downloaded and cleared the PC release. The only hopes of this reaching European Wiiware this week is if it comes in a double bill with the previous episode (which is a very long shot), so what do you think would be the best bet for us Europeans - download the PC version now, or risk a week's wait? Can i start with Episode 4 without playing 1-3? Or is it not recommendable? Best yet? That settles it! Thank you for such an informative review!! @ness = Try SB2 if possible. @Ness, comment #3: All the episodes are loosely connected to each other, so you don't necessarily need to play the prior 3 episodes to understand this one. All you need to see are the 2 SBemails above that give you some info on the whole Dangeresque setting, which should take no more than 10 minutes at that. Hey cool, spoil the end of the game in your review. Awesome, I’m glad I don’t have that to look forward to anymore. Thanks! @ KnucklesSonic8: At first, thanks for the answer. But why should i begin with the second one? According to the review of the 2nd game, it does not substantially improve on the first. And the sentence "this is easily the best episode yet in the series" let me tend to begin with the 4th one, but i don't know if it will be confusing or something like that without playing the games before^^. @ Rexy: Thank you for the information =). If you're tired of waiting I think your best bet would be to wait for Episode 5 and then buy them all on PC. There's a discount if you buy them all simultaneously. Due to my low memory and whatnot on my computer (it's a stone-age WinXP), I can't get them on my computer, and would prefer to play them on my WIi anyway: pointer controls FTW! Anyway, I'm really excited for this one now. 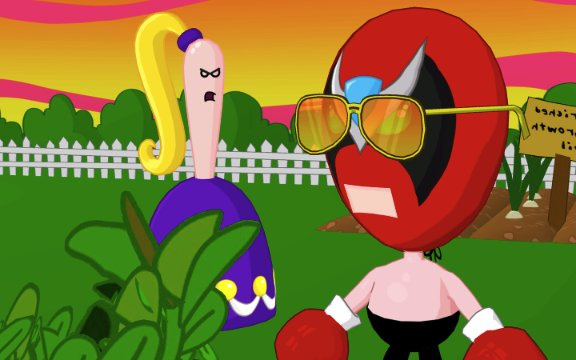 Goddammit Nintendo, WHERE'S STRONGBAD GONE!?! Yeah, this looks amazin. Hopefully we will get 3 soon.. This reveiw sure came out fast. @Drake, comment #8: I'm aware of the discount, though having already cleared the Wiiware versions of Episodes 1 and 2 it might be a bit pricy to get the season pass now. I appreciate what you're saying though. @Rexy: It just works out cheaper to get all five on the PC, than the last three on the Wii - I think... the price conversion things a bit iffy at the moment what with the credit crunch and all. Oh, and this post commemorates my 500th comment on WiiWare World! @Wiiloveit Congrats on your milestone, and thanks for the explenation on why this reveiw came out so soon. I have no complants. Also, any word on a retail release of SBCG4AP on Wii? @Objection_Blaster: Eight...hundred...and...seven...teen? Meh, I'm still proud of my achievement. On VC-Rev's, I think I've posted about 30 times I wonder who's posted the most? Any way of finding out, WWW? Strong Ba....I mean Dangeresque's glasses remind me of Travis's from No More Heroes. @Wiiloveit, comment #14: Are you sure? I looked at the price for the five-game PC deal and compared it to the £21 I'd normally pay for 3 episodes. Because of my location, they added import taxes on top of the payment, so it actually sounds more logical to get the last two instalments seperately, though the format remains to be seen. its a solid 9.25/10 in my opinion. Definitely gonna pick this up... that is, once I've beaten 2 and 3! @Rexy: You're probably just best waiting for the UK release - what with the conversion rates being all over the place at the moment. Thus, the least I (and some of us other Europeans out here) can do is wait for this week's Wiiware update and see what happens. Fifteen whole pence? I could buy three cans of Baked Beans from Netto with that. So it's settled - PC is better than WiiWare! @Objection_Blaster This game takes up 321 blocks. I did not download this game so that is Nintendo's estimate. Come on! I just spend a massive bundle on Tales of Symphonia, Zack and Wiki and Animal Crossing/Wii Speak, not mention some DS games, and now I find that Episode 4 came out of Strong Bad? And it's the best one?! I gotta budget myself . @Drizzt: PHAIL. It's monthly, so you should've been expecting it really. @Wiiloveit: I know, I didn't even know episode 3 was out. I'm just living in my own little world. Well, I bought this anyway after. Haven't had much time to play it though. I bought Sonic Unleashed lol. Yikes, I should really stop spending so much money.